Today after the conference there were seven whole trays of untouched sandwiches, about 20 packets of crisps, 20 big cookies and lots of fruit left over. I originally thought they would be saved for an event happening tomorrow, but the guys in catering told me that it all gets thrown out at 7pm. So, after getting the okay from Sasha to take them and try to give them to anyone hungry / homeless etc, I called Shariff and asked him if he would come and help me carry them and go on a walk together to give them out. Next, we met Andre who was selling the big issue outside Sainsbury’s in Holborn. I asked him if he’d be interested in sharing our food that came from a conference, after asking what conference, and I explaining it was about space and intimacies and all things related, he told me he was homeless at the moment, but he was going to do a PhD at UCL about homelessness and he was already collecting his data for the ethnography he was about to do. He is studying territories that homeless people carve out for themselves and how the discourses around homelessness are almost always missing that angle and he wanted me to share the abstracts from the conference with him. He also told gave us directions to where the food may be most appreciated. 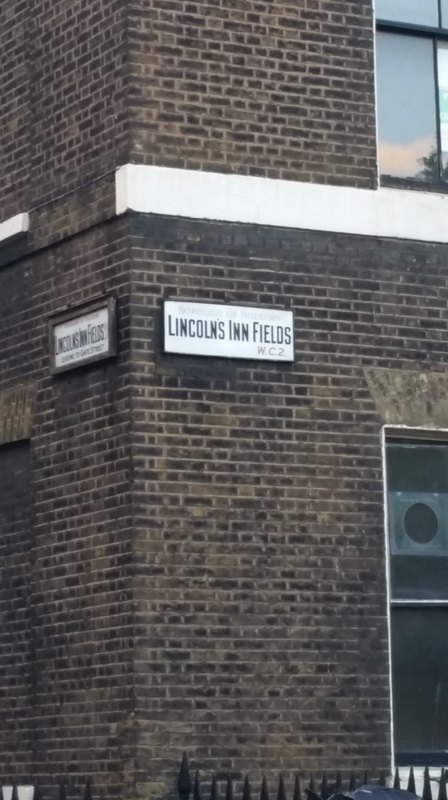 THEN… we went to Lincoln Inns Fields, where Andre had instructed us to go and we thought we saw what looked like a kind of gathering or peaceful protest. When we got closer, we realised there were two tables set up, one with coffee and tea and one with one tray of sandwiches that was quickly running out. On the other side of the tables was a LONG queue of homeless people waiting their turn t to be served. Shariff and I approached one of the men behind the tables and asked if they would accept some food we had to share. The timing was amazing! We came with bags full of food, just as they were running out, and the man was so wonderful he said we could join them giving the food out ourselves if we’d like to stay and have the pleasure of serving others – he was spot on. What was incredible was the alternative reality happening in a road parallel to Holborn High Street.. just on the other side of the suits and rat race was the other world maintained because of what was happening on that side. Never, ever underestimate what your part in change can be. And if you’re interested in doing something about the food that gets to waste; just give it out, find out about the nearest place that does stuff like this and get involved. I gave my card to the guy in Lincoln Inns and he’s gonna get in touch with Birkbeck to see if they’ll allow the team to go over at the end of the day and pick up the food… here’s hoping that Birkbeck’s leftist vibe allows this to happen. The crumbs that fall from our table are not justice, but the an awareness of that is a start to getting it sorted out. Do good anyway – even if it’s good for the wrong reasons. Little is more than nothing. Des histoires… indicibles… Les “chanceux” enfants des rues. The Air that we Breathe… Too much for Street Kids?